Dutch designer David Graas believes that 3D printing will be soon a common service in every city, with 3D printing shops on every corner. 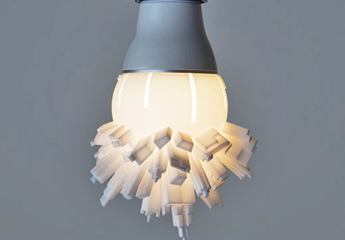 Inspired by this idea, he created Huddle, a 3D printed light fixture featuring a modern cityscape set atop an LED bulb. This brilliant design avoids the need for bulky lampshades, creates zero waste during production and looks great to boot!